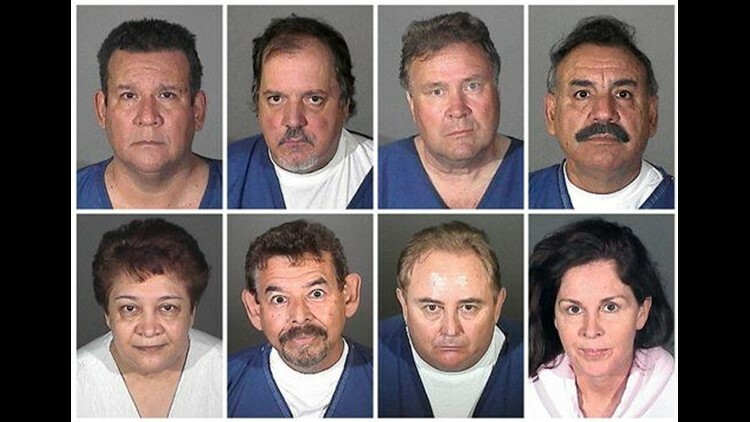 LOS ANGELES (AP) – Eight current and former officials of the city of Bell appeared in shackles before judges Wednesday in a case of alleged municipal corruption that prosecutors say ran so deep it involved personnel who would otherwise have exposed it. Key defendants gained little in their appeals to slash high bail amounts, including ousted city manager Robert Rizzo whose $3.2 million bail was only reduced to $2 million. As Bell's chief administrative officer, Rizzo is accused of secretly accruing a salary of nearly $800,000 and illegally lending city money to himself, his assistant, City Council members, police leaders and officers, and an array of city workers ranging from management analysts to a recreation attendant who borrowed $1,500. "The loans which are the basis of these charges were not publicly approved and the crimes were committed by persons who would otherwise have been responsible for reporting such conduct," the felony complaint stated. The criminal charges stemmed from one of numerous probes of Bell by various government agencies. Bell mismanaged more than $50 million in bond money, levied illegal taxes and paid exorbitant salaries to its leaders, according to a state audit released Wednesday. All eight defendants, who were arrested Tuesday, appeared first before a judge who postponed their arraignments until Oct. 21. No pleas were entered. Three were given permission to post bail immediately, but five others, including Mayor Oscar Hernandez and Rizzo were ordered to appear before another judge later in the day to try to prove they would not use looted city funds to get out of jail and to try to have their bail amounts lowered. Superior Court Judge Michael E. Pastor instead found that the alleged crimes were extremely serious and the defendants might become flight risks. In addition to leaving Rizzo's bail in the millions of dollars, he only made modest reductions for two others and left another unchanged. Two others dropped out of the hearing. Rizzo was singled out for criticism in the state controller's audit, which said he had total control of city funds and used some of the money to inflate his salary and pay off personal loans. When he resigned this year, Rizzo was making almost twice as much as President Barack Obama's salary. "Our audit found the city had almost no accounting controls, no checks or balances, and the general fund was run like a petty cash drawer," state Controller John Chiang said in a statement. "The city's purse-strings were tied to only one individual, resulting in a perfect breeding ground for fraudulent, wasteful spending." The findings "are shocking and detail actions that are reprehensible beyond words," said Bell interim city manager Pedro Carrillo, who requested the state audit in July. He called the audit an invaluable tool to correct the problems and to establish reforms to prevent more abuse. Others arrested Tuesday were current Mayor Oscar Hernandez, former assistant city manager Angela Spaccia; Vice Mayor Teresa Jacobo; council members George Mirabal and Luis Artiga and former council members Victor Bello and George Cole. Prosecutors alleged the wrongdoing by city leaders went unchecked for years because anyone who could have exposed the scheme was reaping benefits. The eight suspects were charged with misappropriating $5.5 million in public funds. However, the audit questioned well over $65 million in city expenses. _The city levied more than $5.6 million in improper sewer, property and business license taxes. _Exorbitant salaries were approved for city leaders without required performance reviews. In the past year alone, the city spent more than $5.8 million on compensation for the mayor, City Council members and six top administrators. _Rizzo used more than $93,000 to repay two personal loans and approved $1.5 million in loans to other city workers even though no city ordinance permitted it. "The controller's audit has determined all of these loans to be gifts of public funds, as they provided no public benefit," the audit statement said. _The city paid $10.4 million to two development firms owned by a contractor who also was the city's director of planning services. _The city made a $4.8 million land purchase from a former mayor without documenting how the land would be used. No work has been done on the property, which contains a vacant store. _The city mismanaged $50 million in bond funds approved by voters in 2003. The city issued the funds without any plan to use the money or any apparent need for the money. Among other things, more than $23.5 million of the bond money went into a non-interest bearing account where it was sitting unused as of last month. Much of the money was designated for a Bell Sports Complex, but the audit found no plans for developing it. "After six years, the city has a dirt lot with a masonry wall," the controller's office said. The controller's office plans to release another report next month on the city's handling of state and federal funds. A third audit to be released in November will address financial reports that an outside accounting firm prepared. Since the scandal broke, public officials, city managers and others have said the situation in Bell showed why people must insist that elected officials communicate honestly and openly. Interim City Attorney Jamie Casso said he expected Bell could carry on business as usual, adding that Carrillo and Lorenzo Velez — the one council member who wasn't arrested — were meeting regularly. Velez was not taking a high salary.